How Much Water Does it Take to Produce a Pound of Meat Today? Have you ever wondered how much water it takes to produce a pound of meat? 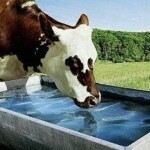 As we all probably know a huge amount of water is used for the maintenance of livestock. The well-known scientist, Georg Borgstrom, food geographer stated at the 1981 annual meeting of the American Association for the Advancement of Science, in a presentation titled “Impacts On Demand For And Quality Of Land And Water” that to produce a 1-pound steak requires 2,500 gallons of water. Here you may read the whole article by John Robbins who addresses the issue above and wonders if the industry has become more efficient or we are still wasting a gigantic water resource on meat production in order to follow our old and drastic dietary habits.